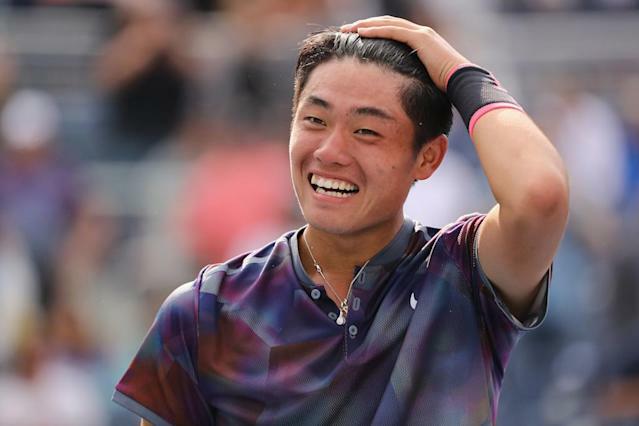 New York (AFP) - Wu Yibing served notice to the world that Chinese men's tennis is on the rise Sunday after capturing a milestone Grand Slam boys singles title at the US Open. The 17-year-old second seed from Hangzhou became China's first boys Slam singles champion by defeating Argentina's top-seeded Axel Geller 6-4, 6-4. "I think this is showing ourselves and showing the world Chinese boys can be good and better -- and Chinese men." Wu made his best prior Grand Slam singles run into this year's Australian Open semi-finals and also reached the Wimbledon quarter-finals. In doubles, Wu joined with Taiwan's Hsu Yu-Hsiou to become the first all-Asian pair to capture the US Open boys doubles crown, defeating Japan's Toru Horie and Yuta Shimizu 6-4, 5-7, 11-9. "It's a really happy (feeling) to win the doubles and singles here," Wu said. "And thank you to all the Chinese people here. It's for China. It's for me." Wu squandered six championship points in the eighth game of the second set before taking the title on his seventh opportunity when Geller swatted a forehand wide after 80 minutes. "That was tough. My hand was shaking," Wu said. "The only thing I can try to do is recover after that. I think I do well in the second service game." The doubles took its toll on Wu during the fortnight as well. "I'm a little bit tired from the doubles," Wu said. "I just hoped to do my best. I just (attacked) the return and tried to do more rallies. I'm trying to give him pressure and try to cover with my volley." The only other Asian player to take the US Open boys title was India's Leander Paes in 1991. Asked about his career goals, Wu didn't jump into an obvious reply about becoming Asia's first men's singles Grand Slam champion. "Top 100," he said. "Yes, the first goal. Easy." Asia's nearest men's singles Grand Slam title hope was 2014 US Open runner-up Kei Nishikori of Japan. Past US Open boys champions who won Grand Slam singles titles include Australia's Pat Cash, Sweden's Stefan Edberg, American Andy Roddick and Britain's Andy Murray. Wu trains in China for Asian events and in Spain for European events. He heads back to his homeland Monday for a Challenger event. "I play against second seed I think," Wu said. "I'll try my best." Geller, who plans to attend Stanford University, also lost in this year's Wimbledon boys final.